Several requests about getting the scanner working on their OSX Lion install with the Dell 3115cn have made me write this post. Some have had trouble getting it to work through SMB. 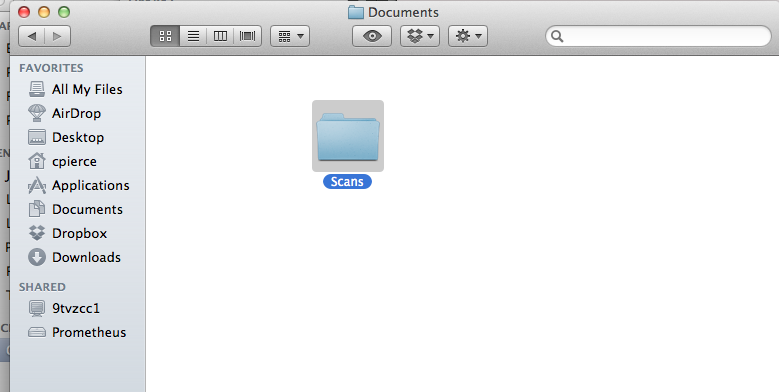 So here goes instructions on how to get your scanner working with OSX Lion via FTP. Please note that this doesn’t actually work the way one might first expect. When most people think of connecting a scanner to a computer they think of the computer doing the work by prompting the scanner to do the scanning. This isn’t actually the case with the 3115cn. It has the ability to do a scan server which is how we will set this up. You can test by going to terminal and typing ftp and see if you can login with your short name and password. Once you are logged in type cd Documents/Scans and see if it lets you browse to that directory. 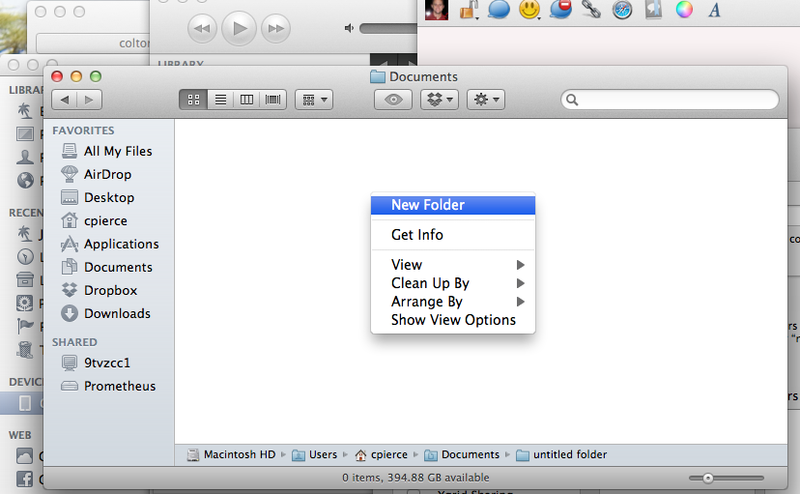 You can even place a file in the folder and see if it is there using the “ls” command. After opening the browser click on the Address Book Button (this is where you’ll be prompted for the password as stated above). Name: Any name you’d like to call this on the printers console screen. Server Type: Tick the radial for FTP (The Default) since that’s how we configured it. Server Port: 21 is the default FTP Port and should be entered here. Login Name: Your “Short” username for your OSX account (ex: cpierce). This was the account name you used when you setup your Mac. Login Password: Tick the Enable Password and enter your account password as entered above). Server Path: Enter “Documents/Scans” (without quotes). Click apply New Settings button. You’ll get an Engrish style message saying something about “updating the data and operate it again later”. You will then see the following Screen. 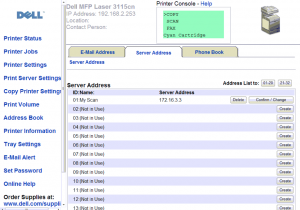 At this point goto your Scan option on the Console of the Printer and try to scan. I hope this helps someone. Thanks for the post. I am getting a 016-781 SMB/FTP Error. This is the error I started to receive when I upgraded to Lion. Any idea what might cause this? On a side note, I do have PORT 139 open, i’ve tried it on both the scanner and computer. At one point, I also received a 016-782 Login Error as well, but the frequent one I receive is the 016+781 SMB/FTP error. Hi Chris, had my DELL for sometime now, this 016-781 has always been a pain when changing anything!! Was in a Windows environment, but am now mac, first snow leopard and now lion. Tried all you wrote (so clear, thanks), now the but, I don’t get the ‘add a port for 139’. Had a look around, but nothing helped. Scanned my mac and came up with ports 88, 445, 57618 for my IPAdr. Turned the firewall off, no help. My config doesn’t have ethernet connected only WiFi. Any ideas?? How can we open port 139? I think after looking at everything, I might have 139 closed. 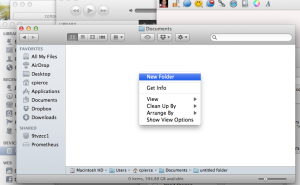 It use to work just fine under Leopard, but not now in Lion. Any luck with opening Port 139? I think that is my issue with the scanner not communicating with the computer. Everything else works fine. see the above comment to @James and tell me if it said connection refused or ^] for you? I am getting a “Connection Refused” on both my main computer and the dell scanner…. i followed the instructions above and get the error of SMB/FTP 016-781 when I try to scan anything. Chris, just to follow up, I’ve followed your instructions from top to bottom in regards to setting up the scan. Everything works great on the printer, expect for scanning. Hopefully that might help. If you need any screen shots let me know. I did this but mine says refused..
Getting the same error as well. guys if you’ll provide me some screen shots and results of your telnet sessions please let me know so that I can help you get this working. sorry for not getting back sooner ;-( Simply an indication of how frustrating this issue is for me, now I HAVE to get it going. james I’m almost certain you don’t have your IP Address set to the same IP Addresses that I use on my home network. The issue you have is your IP Addresses won’t be 172.16.3. but will be something else. 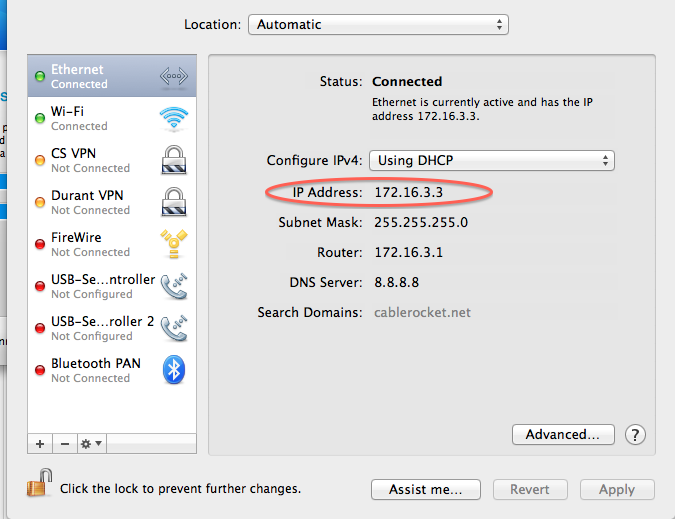 In my tutorial I show you how to get those IP Addresses. Please go back and look at that tutorial once more. OK, my brain is now switched on now. Have gone through the tutorial again…configured ok…still get 016-781. @James what is the IP of the Printer and the IP of the Computer you are connected to via wifi? If the IP Address of your computer is 192.168.178.28 then after you walk through the steps of the computer you should be able to open a connection to 192.168.178.28 139 via telnet. My dell 3115 is setup wirelessly… Always has been… I have always connected to it via WiFi (dell device)… Do I need to wire it? I have tried several ways on the printer panel with the setup. Wirelessly Get IP via – DHCP, AutoIP, Panel… If I set it up via autoip and then connect it thru WiFi I can print but not scan (but I believe that cause it makes its own IP once it connects through WiFi). If I set it up any other way I can’t seem to print at all. Maybe some of our problems occur with how we have our setup/settings on our printer panels themselves. 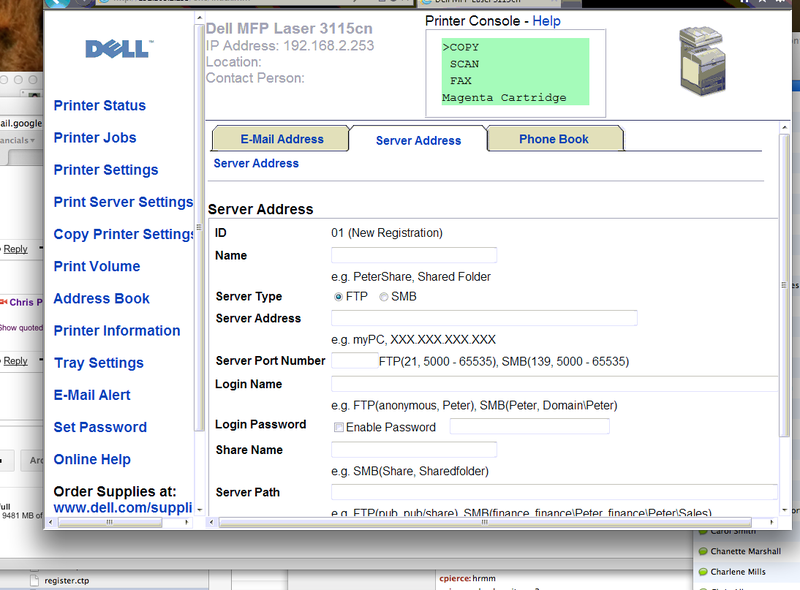 Now that I printed something and have an ip on the printer (169.254.84.69) I can login to the printer (opening browser step) via the 169.254.84.69 ip… so now should I change the ip’s there to the network ip of 192.168.1.102 with the port 139? nothing wrong with setting it up via wireless. My wife does that. Please note that both interfaces can hold an IP and will keep seperate settings. So it is possible for both the wireless and the wired to have a seperate ip address. 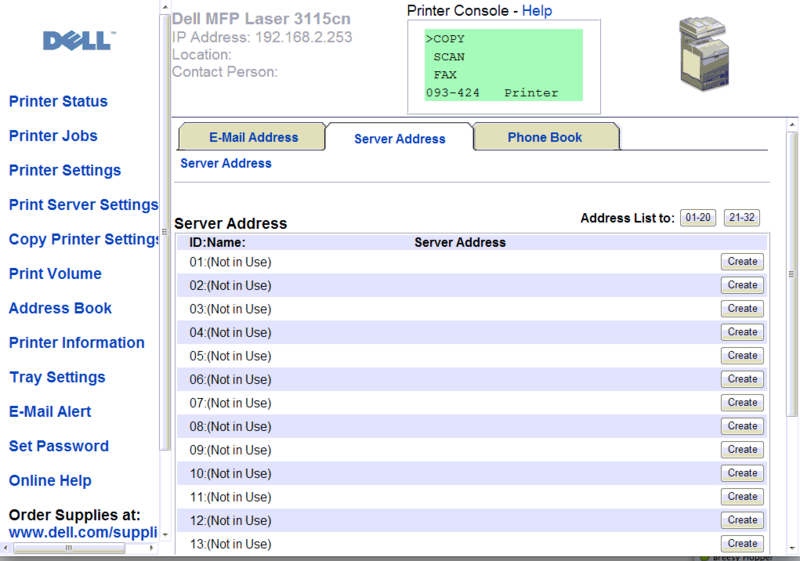 You’ll need the network ip of the printer to be 192.168.1.x o that it can be on the same range. But the ip shouldn’t be 102 as that is the ip to your computer. I’d suggest setting it at 192.168.1.10 netmask 255.255.255.0 so that the printer can always be accessed via the same IP Address. From there open your terminal and see if you can “telnet 192.168.1.102 139” which will see if you have the port open for 139 on your mac (which has the address of ….102. Let me know. At this point I opened terminal and got this. if you can’t telnet to the 102 then don’t even worry about your printer. You must first get your computer to accept connection via itself before you worry about other devices connecting to it. I have a linksys e2000 router… I have looked through there for port info but don’t see anything blocking ports… do I forward a port? I tried 23 instead of 139 cause it showed obove. I have other options – Port Range Forwarding – Port Range Triggering… I have nothing filled in on either of those. Is there something in system preferences I’m missing? I have a time capsule also with airport… something in there jackin with me? when I look at airport utility and manual setup on the time capsule then look at that IP it shows 192.168.1.104..
@Kory it shouldn’t have any issue with it. Would you mind if I remoted your system to take a look? Where can I email you? Thank you! I have had this printer for years and I’ve never been able to scan with it. IT WORKS!!!! Thanks again. Will you be willing to remote to my computer for a repair? I’m willing to pay a fee for it. I for some reason can’t seem to get the scanning portion to work. Everything else, works great, expect, scanning. Thank you! ** Update – the new instructions are easier and work a ton better. Chris – I can’t begin to thank you enough. I was so disappointed when I upgraded to Lion to find I could no longer scan documents to my Mac from by Dell printer–something I do almost daily. Your instructions were perfect and easy to follow. Thank-you, it works like a champ. in my office i’ve got 3 PCs and recently i bought and iMac. I cant use the scanner on my mac even with above setting can u please help me? Hi Chris – thanks for the pointers. But I have trouble with terminal. Can I select ‘remote login’ under system preferences instead? I have tried it but am having issues. Any pointers gratefully received. Not sure i’m following. You can’t use terminal? Finally got it working!! Thank you so much! worked perfectly ! – thanks for blog post…. I now have a working Printer AND Scanner! Thank you so much for your tutorial! Awesome…works perfectly. Any help on getting it to scan to email? 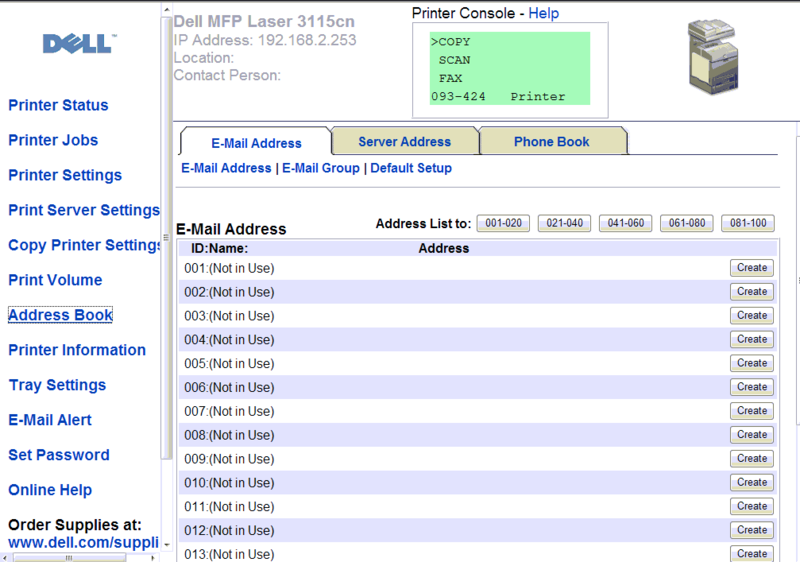 I’ve had pretty good luck with scanning to email with Dell printers but there are so many different factors. I’m using gmail and have had good success. What mail provider are you wanting to use? Hi Chris, I’ve looked at your various posts but can’t sort my problem which is that I can’t scan to my computer since upgrading to Lion. Your driver upgrade downloads but gets stuck when installing and I don’t understand your step 2 above. What does “open terminal” mean please? and where do I go from here. Thanks. Terminal is a command prompt style application for Mac OS X. The Terminal can be opened by looking in Applications->Utilities and running Terminal.App. Sorry, Found Terminal and typed “sudo…..plist” closed, created scans folder in Documents, typed “ftp” in terminal and now have ftp> and am now stuck. Type in log in user name and password after ftp> ? with space or how? Thanks. 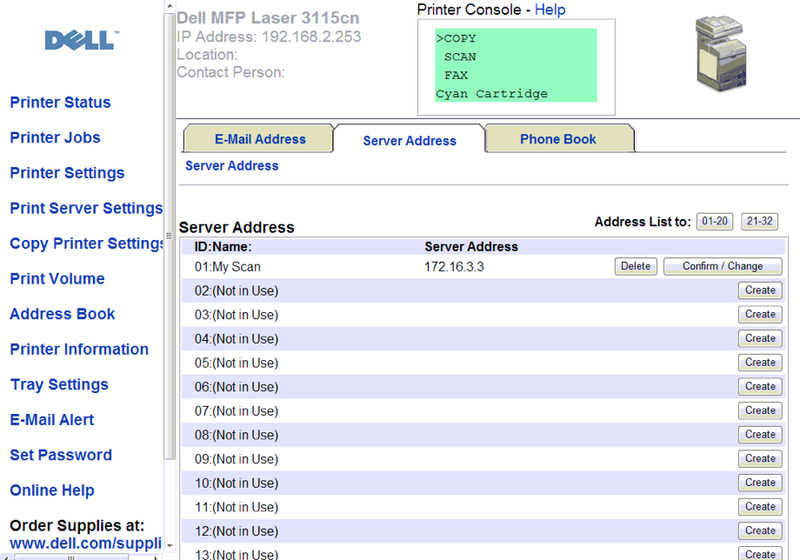 Chris, Thank you for this help in connecting the dell 3115cn scanner to my MAC. Followed your directions; works great on my Lion. Tried the same procedure on my partners’ Snow Leopard. I get a “not connected” message in Terminal, when using the cd Documents/Scans. Is there something else that I should do? Thank you for your coaching. Hat off to you Chris! Perfect post, everything works fine now with my Dell 3115CN and 10.8. I couldn’t work out why the printer never showed my Mac, but as soon as I did this it appeared on the menu and your settings worked like a charm. 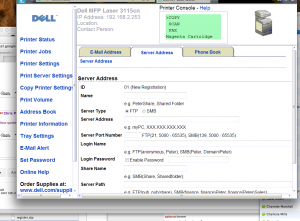 I have set up the Address book as described, in fact I have a number of entries as I am trying all sorts of options, the Dell printer sees all my option and I can select any of them, they all give me the same error. Followed the details letter by letter, tried a bunch of different user names, still the same issue. The only thing that I have different is the sudo command, when I run this in the terminal it asks for a password, I have no passwords setup. if you are having trouble with STEP 2. Any further help would be appreciated. Thanks. p.s. I changed my ISP a year ago to BT (UK) Could it be something to do with the firewall? Thank you! I followed your instructions above and hey presto! suddenly the scan to my MacBook Pro just…works! I’m so glad! BTW, my OS is Yosemite 10.10.4., and I didn’t have to change anything from the above, even though my Telnet said connection refused and so on. Does anyone know how to configure the file name of the scan pdf, or are we stuck with img-123456789.pdf? Thanks again Chris, I’m very grateful. Thank you this worked for me. I was getting ‘Not Connected’ at stage two when typing FTP> cd Documents/Scans but it didn’t affect the scans from arriving to my iMac. I am also on Sierra. Only question I have is, is opening FTP secure? Could you please also do a tutorial on scan to email? Would greatly appreciate it!